Trouble watching or editing video on Mac because of compatibility issues? Your troubles are over. HD Video Converter for Mac lets you easily convert videos, movies and TV shows to optimized preset formats to fit for video editors and various mobile devices (iPad, iPhone, etc). This cross-platform app is available for both Windows and Mac. The HD Video Converter for Mac is an easy to use media converter/transcoder for Mac that works seamlessly with iMovie and Final Cut Pro 6/7/X. 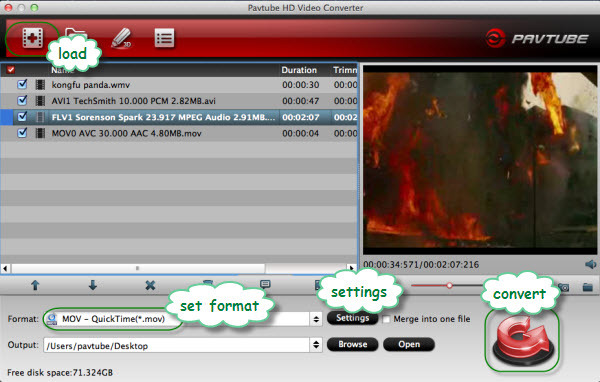 It converts video from and to any format, making it easier than ever to get videos compatible with FCP. The guide below shows you how to put together H.264, QuickTime, AVI,MPG and FLV videos for editing in Final Cut Pro 7 with optimized presets. 1. Run the HD Video Converter for Mac. Drag and drop all source videos to the software. HD Video Converter for Mac supports various popular video and audio formats, including Flash Video/YouTube video (*.flv, *.f4v), HD Video (*.tod, *.mod, *.mov, *.mts, *.m2t, *.m2ts, *.ts, *.tp, *.trp, *.evo, *.mkv, *.dv ), General Video (*.avi, *.mpg, *.wmv, etc), QuickTime video(*.mov), DVR Videos (*.tivo) and more. 2. Click on “Format” bar and select the proper target format and output profile for encoding H.264, QuickTime, AVI, MPG and FLV videos. 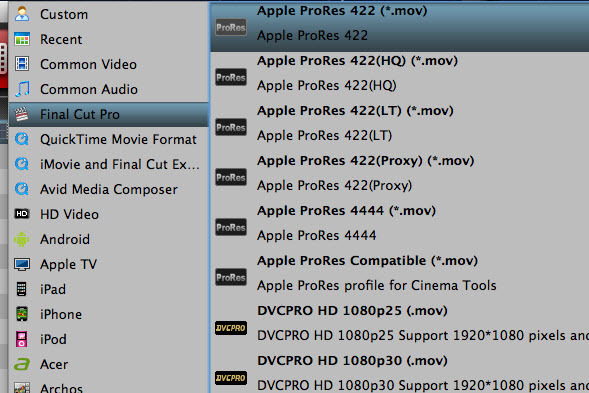 For editing videos in FCP, the best output profile is Apple ProRes 422, which is naturally supported by FCP. 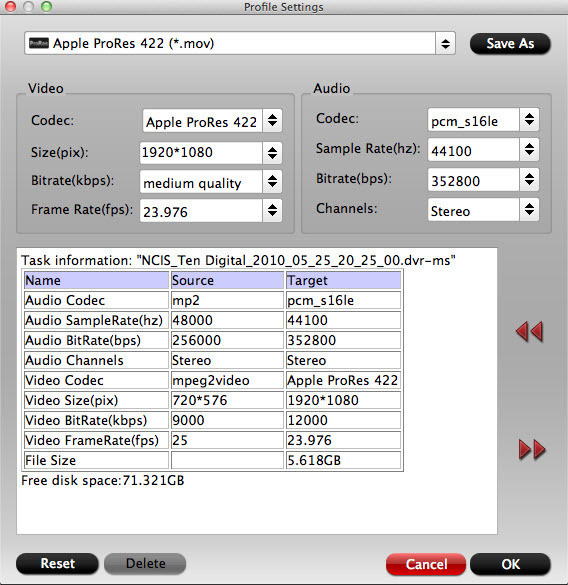 The HD Video Converter for Mac provides all ProRes codecs, including ProRes LT that is no longer available on FCP X. 3. You can use custom presets for encoding. To do this, click on “Settings” and set video/audio parameters. For instance, choose HD Video 1080P: Bitrate- 5000 kbps; Frame rate: 30fps; Audio: MP3 - 256 kbps. 4. Press on the big convert button to get HD Video Converter put together H.264, QuickTime, AVI, MPG and FLV videos to ProRes .mov. When conversion finishes, press “Open” to get converted MOV video. 5. Now Open up FCP, and go to “File>>Import>>Files…” to import converted .mov footage to FCP project. This amazing Mac video converter handles the complicated settings for you. It enables you edit all kinds of high quality video in iMovie, Final Cut Pro and iDVD after converting videos with the optimized presets.